Dennis Stelling is the heavy hitting, stick twirling, song writing machine behind bands like VOZ, Distorted Voices, InRuinz, and Ghost Tribe Rebellion. He is a self taught drummer whose raw talent, rock solid meter, unique style, and showmanship have earned him a place as a technically proficient, well respected drummer. Dennis’s career all started with a drum set as a gift from his older brother. While he has been influenced by many artists and bands, top on the list is Kevin Sofferra (Howe II, Breaking Benjamin, Seether). 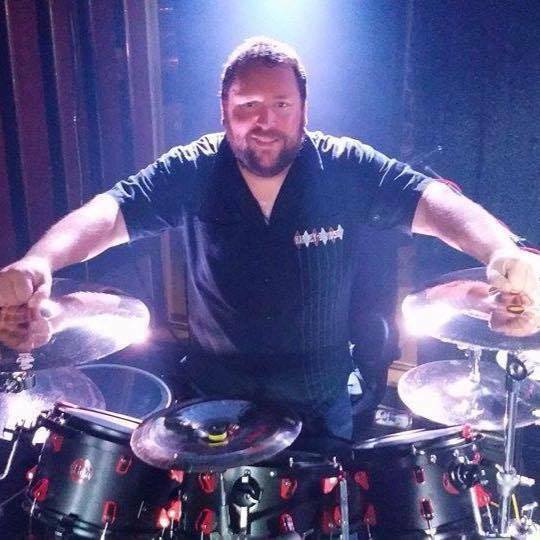 Others favorites include drummers Mike Portnoy, Neil Peart, Josh Eppard, Gavin Harrison, and Tommy Lee as well as bands such as Coheed and Cambria, Breaking Benjamin, 5 Finger Death Punch, Evan’s Blue, Hierosonic, and many more. Over the course of his career, he has performed all across the United States and Canada with bands such as InRuinz, 519, Symbol of Sorrow, Dr. Jekyll, Distorted Voices, Ghost Tribe Rebellion and The Tom Martini project. He has shared the stage with legends such as Jackyl, Mushroomhead, Gwar, The Black Crows, Firehouse, WASP, Michael Graves, and others. Dennis’s ability to adapt to different musical styles sets him apart. Since he is no stranger to the stage or the studio, he has been asked to work with artists in all different genres. Between his work with with Distorted Voices, Ghost Tribe Rebellion and InRuinz, he has recently begun collaborating with Hip Hop producer Dayon “Mohlz” Mohler. This ability to adapt to different styles has caught the attention of international recording artists, drum manufactures, and radio stations. No matter what you’re doing, you’re going to want to keep an ear out for what comes next from this talented musician, singer, and songwriter.